While Fuller was a very popular preacher, it is well-known that he was perhaps not the best preacher. In doing some reading and thought into Andrew Fuller the Preacher, I came across some interesting quotes in which everyone may be interested. “His own sermons were weighty, logical, and grave; he had not the finish of Foster not the splendor of Hall, but his simple and vigorous style expressed simple and vigorous thought; that he was an effective preacher may be inferred from the fact that when Thomas Chalmers listened to him he resolved to so far make Fuller model that he would never again read a sermon, but henceforth trust to extemporaneous delivery” (T. Harwood Pattison, The History of Christian Preaching [Philadelphia, PA: American Baptist Publication Society, 1903), p. 287. “There is little warmth–no heat; imagination is scarcely in evidence at all; and ‘flights of eloquence’ nowhere appear. The sermons on themes are orderly, discriminating, logical; the expositions… are careful and plain, in homily form; the style is clear and even, but lacks grace, fervor, and movement. Excellent good sense and timeliness for their day characterize the writings of Fuller, and they did good and enduring service; but they have not enough literary quality to make them standards, and their adaptation to contemporary though has, or course, passed away with their own times” (Edwin Charles Dargan, A History of Preaching [New York: George H. Doran, 1912], II:333). “As a preacher he soon became popular, without any of the ordinary means of popularity. He had none of that easy elocution, none of that graceful fluency, which melts upon the ear, and captivates the attention of an auditor. His enunciation was laborious and slow; his voice strong and heavy; occasionally plaintive, and capable of an agreeable modulation. He had none of that eloquence which consists in a felicitous selection of terms, or in the harmonious construction of periods; he had a boldness in his manner, a masculine delivery, and great force of expression. His style was often deformed by colloquialisms, and coarse provincials; but in the roughest of his deliveries, ‘the bones of a giant might be seen.’… In entering the pulpit, he studied very little decorum, and often hastened out of it with an appearance of precipitation… Not aware of its awkwardness, in the course of his delivery, he would insensibly place one hand upon his heart, or behind him, and gradually twist off a button from his coat, which some of his domestics had frequent occasion to replace…. He was not the exact model of an orator” (J. W. Morris, Memoirs of the Life and Writings of the Rev. 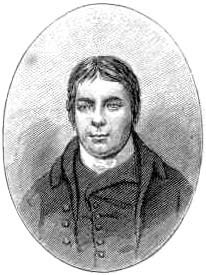 Andrew Fuller, late Pastor of the Baptist Church in Kettering, and Secretary to the Baptist Missionary Society (n.o. High Wycomebe, 1816), pp. 81-82). These are just a few looks at Fuller’s pulpit ability. Yet, for Fuller it was passion in the pulpit over rhetorical and oratorical skill that he rightly stressed was important for the preacher. This entry was posted on Monday, April 9th, 2007 at 3:04 pm and is filed under Andrew Fuller, Preaching. You can follow any responses to this entry through the RSS 2.0 feed. You can leave a response, or trackback from your own site.